Hey Hey, It’s A Colorway May! Hope everyone is enjoying the springtime wherever they are. It’s one of my favorite times of the year for so many reasons. One of those reasons is that there is music seemingly everywhere and anywhere, inside and out. So this update on the band is to tell you about two indoor shows and one outdoors one. Tonight, (Friday, 5/12) if you’re in the Boston area come check out a great four band bill at PA’s Lounge in Somerville, MA. Doors are at 7:30 and music starts at 8pm with a nu-wave pop-rock band called DIVVISIONS, followed by the alternative rock trio, The Amy Incident, and a great (mostly) instrumental rock band who we played with at the Middle East a while back called The Slum Raisins. It’s only $10 for a whole night of music from four very different groups. Colorway is on last at 11pm. Hope to see you there and if you can’t make it but know somebody who can why not forward this email along or share the Facebook Event Page with them. Next weekend we are off, but if you want to go cheer on Colorway’s Matt and Riley with Shokazoba as they compete in the Valley Music Showcase at New City Brewery in Easthampton, MA on Friday, 5/19 check out the Facebook Event Page for that here. Memorial Day Weekend is a big one for us as we head back up the interstate and back into the green mountains of Burlington, VT. We’ll be at Manhattan Pizza right in downtown on Friday, 5/26. We play from 10-1am and it’s a no cover show. Facebook Event Page for that is right here. Closing out the weekend and the beautiful month of May, on Sunday, 5/28 (rain date, Monday, 5/29, 5-10pm) we are thrilled to be taking part in the Forest Fusion Fest happening at Deja Brew in Wendell, MA. This is an outdoor show and we will be kicking things off at 7pm, followed by Jam-Atan Abina (Latinx, hip hop, reggae, world music from Amherst) at 8:15pm and then Shokazoba at 9:30. DJ Vibewise takes over after that and spins great tracks to chill you out until 12:45am. For more details see the Facebook Event Page here. Word to the wise, there are only 200 tickets to this show and it will surely be a sell-out by showtime. So if you’d like to purchase an advance ticket you can get yours at the Wendell Country Store, the Deja Brew or from any of the band members involved. You can just respond to this email if you’d like to work it out and I’ll get back to you toot sweet. So, there you have it folks. That’s it for this month. Plenty more shows this spring, summer and fall and you can see all of that good stuff by going right here. Lastly, I want to thank everyone who came out to the shows we played in NYC, Richmond, VA, Raleigh, NC and Washington, DC. We had such a blast getting out on the road and playing for you all. Thanks for being so supportive whether it was posting a photo, video clip (thanks, Drew! ), buying a CD, tee shirt or just signing up on the mailing list. We can’t do this without you all, so thank you for keeping us going. You can check out some photos from the trip here and see a video of the song, “This Happens To Everyone” from our show at The Pour House Music Hall in Raleigh, NC right here. We are currently planning a return in late fall to keep the momentum rolling. Okay, gotta go pack up the car and get ready for tonight’s show but I’ll send out another update in a couple of weeks to update you on what’s in store for June (like Shrine in Harlem, Saturday, 6/3). Until then, enjoy the spring and keep music in your lives. It may be the best thing ever. Thanks again and we’ll see you at the shows! We’ll be performing along with our friends from Somerville, The Slum Raisins (instrumental rock) as well as The Amy Incident and DIVVISIONS. Join the Facebook Event Page here! Come pizza party with us as we head back up north for an all-nighter to kick off Memorial Day Weekend in the heart of downtown Burlington. Join the Facebook Event right here! This is gonna be off the chain. Colorway kicks off the night followed by Jam-Atan Abina (Latinx, hip hop, reggae, world music from Amherst) and then the thunderous, cosmic, funkestra sounds of Shokazoba (featuring Matt and Riley on bass and drums). People of the Pioneer Valley! Shokazoba and the Deja Brew Cafe & Pub proudly present the very first FOREST FUSION FEST!!! One day! Three bands! One DJ! Out back at the Deja Brew!!! Remember, the new album is available at www.colorwaymusic.com on CD and 180gram vinyl, as well as at www.colorway.bandcamp.com for the digital download. And to celebrate a year of The Black Sky Sequined, through the month of May everything in the store is 20% off. But you can also pick it up an any one of these great Valley establishments. Support your local musician and support you local music store. Been back a week now and just wanted to thank everyone who made our most recent tour a success. Silvana​ NYC and Drew Mrrattles d’Auguste​ as well as Gonzalo Silva, everyone at Crossroads RVA​ in Richmond, all the folks involved with Spittle Fest​/ Spittle Fest 2017​ in Raleigh: Temperance League​, PALEFACE​, Hank Sinatra​, Lutie Cain​ and Maldora​, Peter Holsapple​ and, of course, Jac Cain​. 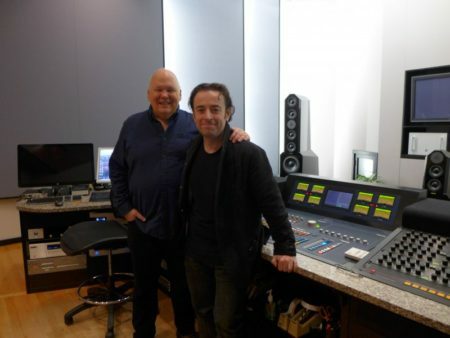 Thanks to Lisa Lewis​ for the hospitality. Next time we’ll get that hot donut, for sure. Props to The Electric Maid​ and Avoid DC, Syndicate 51​ and Bay Creatures​ for help with the gear and Lisa Missenda for the great photos. 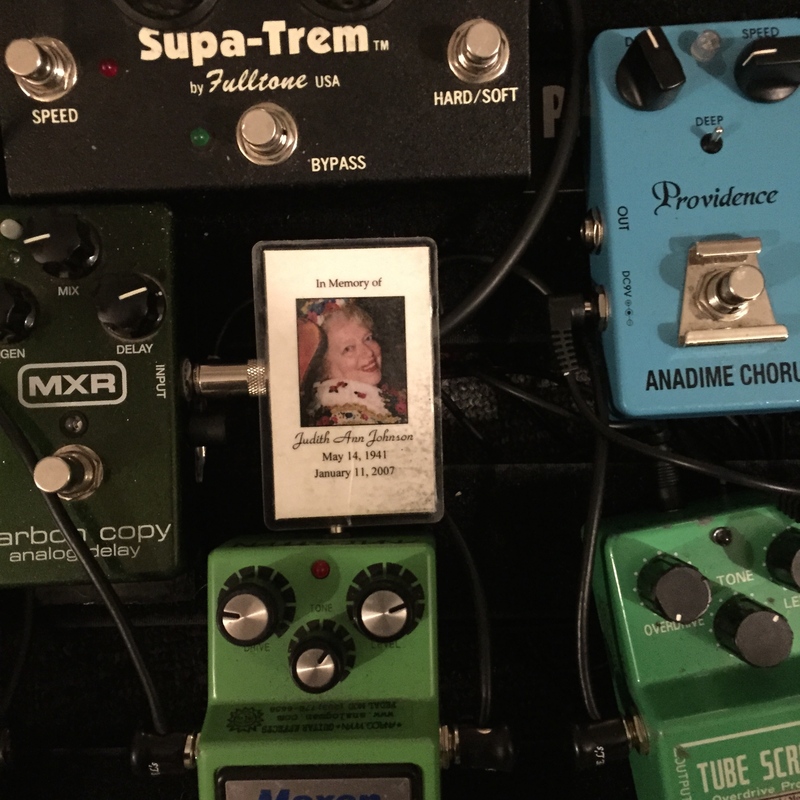 And a huge thank you to Will Timpson​ and fam for your hospitality. There’s more people I’m probably forgetting so please forgive me. And finally a big thank you to all the new fans we made along the way. We can’t do this without your support, so here’s to lots more rock coming your way. If you bought anything at the merch table, threw some money in the tip jar, signed up on the mailing list or even just came up and said hi after the show we thank you from the bottom of our heart right up to the top. Share us with your friends and keep track of us ’cause we’ll be back again for sure. I think I can safely say on behalf of Matthew​ and Riley​ that we had a ton of fun seeing some new sights together and playing so many different rooms for you all. So thanks again and we’ll see you out at the shows. PS: You can see some photos from the tour right here. Colorway’s Second Album The Black Sky Sequined Turns Two! 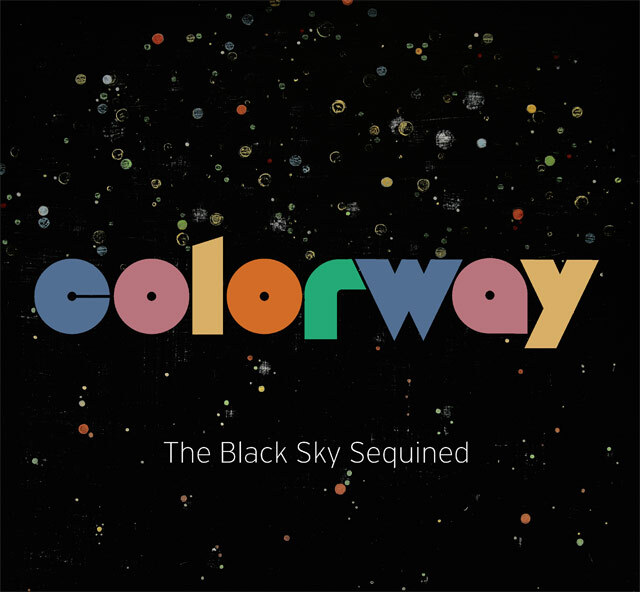 Two years ago today Colorway’s second, full-length album, The Black Sky Sequined was released. You can see some pictures from the recording of it right here. 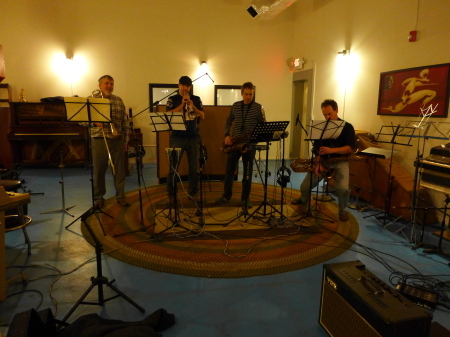 The two week process began in the middle of October of 2014 at Sonelab​ in Easthampton, Mass with Mark Alan Miller​ at the controls and me and J.J. O’Connell​ and Dave Hayes​ behind the drums and bass respectively. The ten song album will always remind me of a special time in my life–gaining a better understanding of what this band means to me and what I hope it will mean to anyone who cares to let us in to their world, even for a few minutes. It’s different from the first album because before we went in to record the debut we had never really played out as a group. This second effort showcased how far we had come as a collective unit. I hear it in every note in every song. I managed to recruit the bafflingly talented David Trenholm​ to score a horn section for the closer, “Telephone” and arranged for Tom Mahnken​, Nick Borges, Terry Nagel​ and, of course, Dave T to play the parts. I was lucky enough to have some amazing artists grace the cover, namely Laura Nugent (for the front), Pietro Spica​ (for the back) and the incomparable Jodi Nicholas​ for the gatefold. And, of course, the ever present logo work of Tom Pappalardo​ who also did the layout of the album. 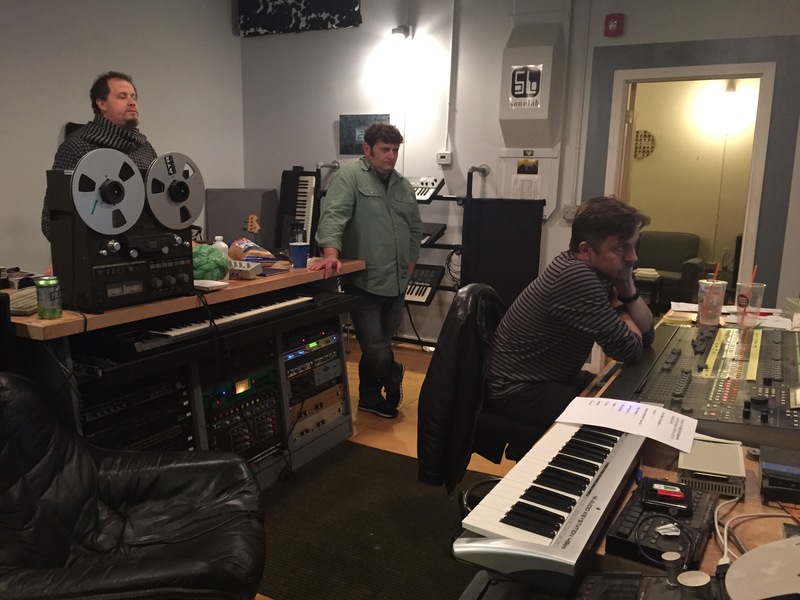 When it was ready to get pressed I got to check a big box off the list and was able to work with the legendary audio engineer, Bob Ludwig​ at Gateway Mastering​ in Portland, ME (I was sandwiched between sessions by Death Cab For Cutie and Mark Knopfler–wild world, eh?). This certainly fulfilled a lifelong goal of having his memorable name on one of my albums (check five albums in your collection. I’m willing to be he mastered three of them). The vinyl was sent to Bernie Grundman Mastering Studios​ in Hollywood on Bob’s recommendation and was lovingly prepared for replication by another audio legend, Chris Bellman. To see his “CB” on the dead wax always makes me smile. The album sold well and got some pretty stellar reviews which was nice to see. 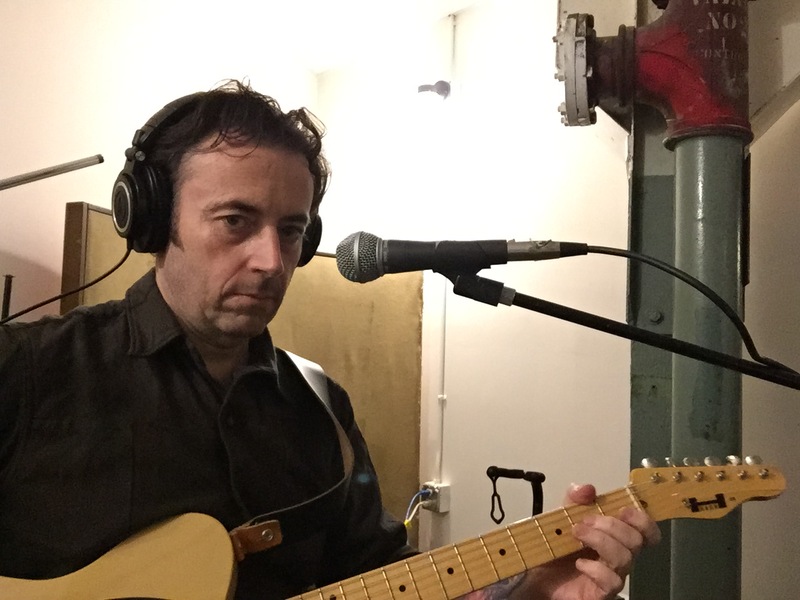 WRSI – 93.9 The River​ put “Come Back July” into its regular rotation and became a sort of theme song for those who pine for the heat here in New England through six months of cool, chill, cold, freeze and thaw. They still play it here and there and we’re all so lucky to have a AAA radio station that cares about its local heroes from their start all the way through their careers. The great videographer Tom Adams​ at Reelife Productions​ produced a fantastic video that was shot right here in the valley and was fun to make and still fun to watch (it helps that July is only two months away). You can see it here. Dave, JJ, and I went on the road for a bit in support of it and had some fun shows and met and reconnected with some great people from here to Raleigh, NC and back again. The band evolved over that same time period for natural and understandable reasons. And now–and for almost two years–I have had the pleasure of getting to know two amazing musicians Matthew Clegg​ (bass) and Riley Godleski​ (drums/vocals) who help bring my creations to life. 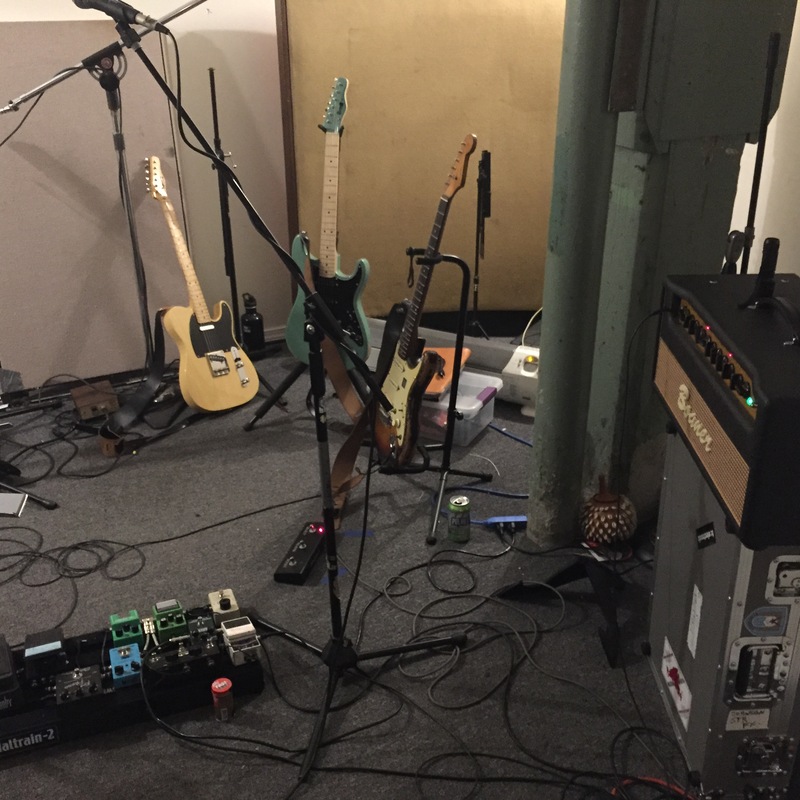 We work well together and–though it’s a busy year for everyone–we’re planning to get back to work and put some of the new music down on record to share with the world sometime soon. Then it began. Rockets. Stars. Flowers blooming. Reds, yellows, blues, greens. Silver and gold. Fireworks and the cheers of spectators. So thanks for all of you who have hopped on the Colorway train over the past five years. It’s been a thrill to play this music for you. Thanks for supporting our efforts, for buying our albums, for sharing our links, for coming to the shows and for just being you. And Happy Birthday and Sto Lat to The Black Sky Sequined. May the music roll on and on and on . . .
PS: If you’ve made it this far I should probably tell you that in honor of the two year anniversary everything is on sale at the Colorway store. Check it out right here. Happy New Year! Bring On The Rock And/Or Roll. Three for free this weekend! These Are Still The Days! Let’s Share Them Together. This Is The Day! A New Album Is Born And We’re Throwing A Party! Big March Of Music Is Upon Us Plus FAJ Solo Shows In Japan!! The Shortest Month Has So Many Shows! Sign up on the mailing list and we'll keep you up to snuff on the latest stuff. ©2013 Colorway Music. All rights reserved.